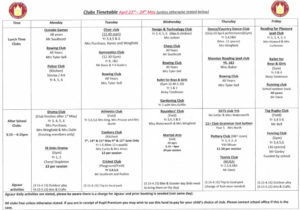 Our excellent facilities and enthusiastic staff and parents mean that ALL pupils from Year 1 upwards have the opportunity to join club activities during lunch times and after the school day. There is a wide variety of Sports Clubs – availability depends on the time of year – including Football, Netball, Rugby, Cross Country Running, Gymnastics, Hockey, Athletics, Cricket, Table Tennis, Martial Arts, Fencing, Basketball, Trampolining, Ballet, Yoga and Rounders. Children in KS2 have the opportunity to join sports teams and we regularly play inter-school and inter-county matches. We are proud to regularly be able to celebrate our children’s sporting achievements with medals, trophies and colours to be worn on school uniforms. 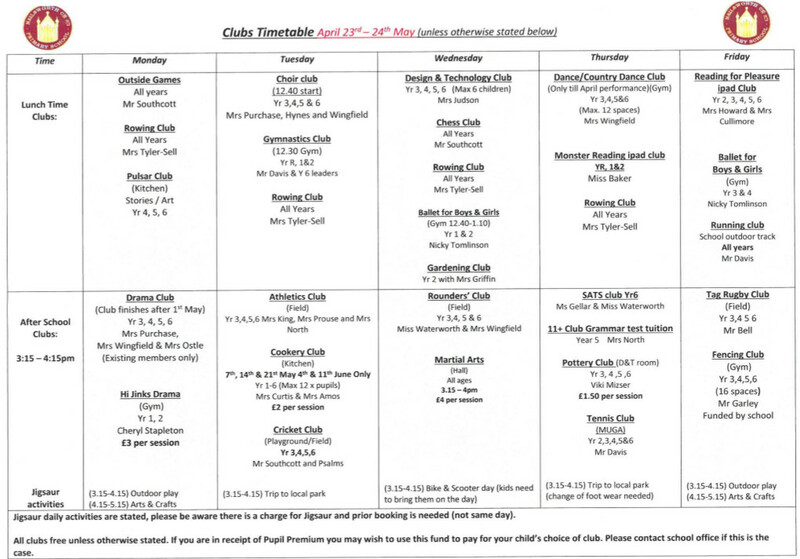 Other Clubs include Cookery, Chess, D&T, Reading for Pleasure, iPad, Nature, Pulsar, SATS and Gardening. The majority of clubs are free of charge, but some, such as KS1 Drama, Tennis and Martial Arts, are provided by an external supplier and there is a cost involved. Swimming lessons are available from Year 1 onwards.